Commonly chancing upon the instrument of the grill. Saint Fausta lived during the reign of Emperor Maximian (286-306), and was from Cyzicus. The daughter of pious and wealthy parents, after their death when she was thirteen she was left a wealthy lady who had much property. Even before this when she was a child, the deceit of riches were not able to separate her from virtue and good works. She occupied herself with fasting and prayer, and the study of the divine Scriptures, and gave herself over to the incorruption of virginity. Her fame even reached the Emperor, for which reason he sent to her a notable man of the Senate, whose name was Euilasios, who was sent to urge her to sacrifice to the gods, and if he was not able to do this, to drown her in the sea. Euilasios therefore went, and the young maiden was brought before him. Unable to persuade her to sacrifice to the gods, she boldly confessed Christ as true God. For this her head was shaved and she was severely beaten. As she was being beaten, the Saint prayed for God to help her, whereupon lightning fell from the sky and killed a number of pagan onlookers. Faustus was then shut up in a wooden box, and Euilasios ordered executioners to saw her in two, but they were unable to do so by the grace of God. Perplexed by this, Euilasios called for Faustus and asked her about the mysteries of her faith which affords her such strength. As he listened, the grace of God touched his heart, he believed in Christ, and he set Fausta free. However, one of his servants went to the emperor and denounced him, so in a rage the emperor sent the prefect Maximos, a notoriously cruel man, to punish the rebellious senator. Arriving in Cyzicus, Maximos had Euilasios brought before him in fetters. He was suspended to a wooden post, and Maximos ordered for his flesh to be pricked and punctured with their swords. Sustaining this torment for a considerable time, he prayed, "Almighty Lord, save me now just as You came to the aid of Your servant Fausta, for it is You whom I love." After they had burned his sides with flaming torches, he asked for Fausta to intercede for him. Then the prefect had Fausta brought before him, and he had nails driven into her ankles. The holy maiden did not cringe by this, but she was preserved unharmed. Therefore she was cast to wild beasts, but these became tame when she approached them. Other torments proved equally ineffective, so she and Euilasios were stretched out on a red-hot gridiron. 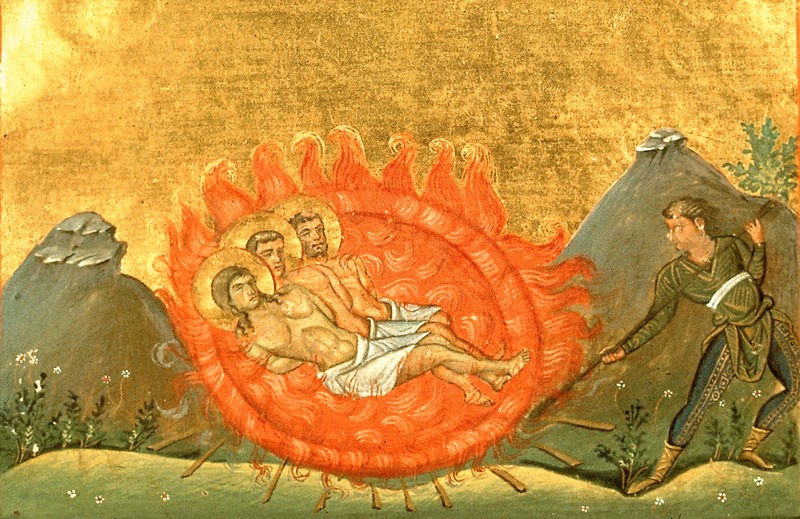 The two Saints praised God in the midst of the fire like the Youths of Babylon in the furnace, and their hymn of victory pierced the stony heart of Maximos. This caused him to submit to the action of divine grace, and looking up to the heavens he saw the Son of God in His glory. With this he removed his clothing and joined the two Martyrs on the gridiron. 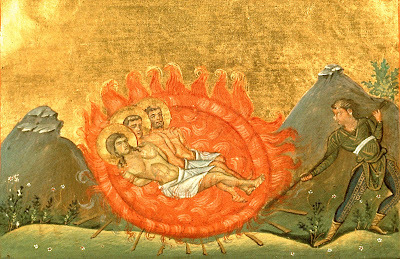 In this way the three Holy Martyrs received crowns of martyrdom.